Johannesburg - The company that reportedly failed South African troops in Bangui, in the Central African Republic last year, has since secured 91 tenders worth R209m, the Mail & Guardian reported on Friday. A tender list compiled for its investigative unit amaBhungane shows that between last April and this June, the aircraft brokering company Y&P Logistics received contracts from the SA National Defence Force allegedly three times the combined value of business granted to seven other approved bidders. The newspaper reported that during the battle of Bangui in March last year, Y&P Logistics failed to supply an aircraft on time to deliver vital equipment needed by troops on the ground. 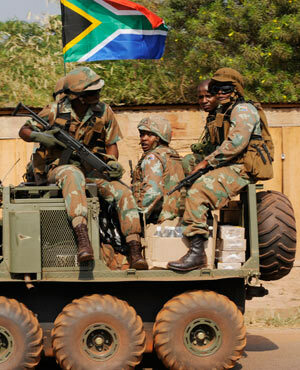 Thirteen South African soldiers were killed and 27 wounded when they were ambushed by rebels in the CAR. The M&G reported that a senior officer intervened to cancel an emergency contract operations staff had negotiated with a company that had an aircraft available immediately. Y&P, on the preferred suppliers' list, had already said it could not help. Staff were instructed to try Y&P again and they then said they could deliver the aircraft for the transport of support equipment, including armoured vehicles, to Bangui. The company which was cancelled still had to be paid for being on standby. Y&P delivered the aircraft days later than it said it would, while soldiers waited at Bangui airport. Y&P spokesperson James Duncan denied the allegations as "extremely unfair, unsubstantiated and defamatory" and said the company would institute action against the M&G if it published the allegations.